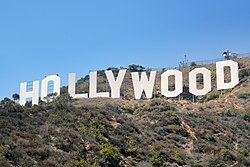 Hollywood je adugbo kan ni Los Angeles, California, ni orile-ede Amerika to budo si iwoorun-ariwaiwoorun ni isale Los Angeles. ↑ 1.0 1.1 "LA Almanac". Archived from the original on September 5, 2006. Retrieved May 24, 2007. Àtunṣe ojúewé yi gbẹ̀yìn wáyé ni ọjọ́ 14 Oṣù Kẹta 2013, ni ago 08:38.